Game: Missile simulator inspired by radar displays from World War II. Created by: Thomas T. Goldsmith Jr. and Estle Ray Mann. When:	Patent was filed on January 25, 1947 and issued on December 14, 1948. Technology: Analog circuitry to control the CRT beam and position a dot on the screen. Screen overlays were used for targets since graphics could not be drawn at the time. Game: theoretical computer chess program as an example of machine intelligence. The program was only capable of computing "mate-in-two" problems and was not powerful enough to play a full game. Created by: Alan Turing, a British mathematician. When: theory written in 1947. Game: the game of Nim. Could play either the traditional or "reverse" form of the game. When: presented at the Festival of Britain	on May 5, 1951. Technology: the NIMROD computer was the first instance of a digital computer designed specifically to play a game. This machine was based on an original design built by E.U. Condon in 1941, after having acquired a patent in 1940. The machine weighed over a ton, and a duplicate was displayed at the New York World's Fair. NIMROD . Technology: first computer game to use a digital graphical display. It was designed for the world's first stored-program computer, and used a rotary telephone controller for game control. 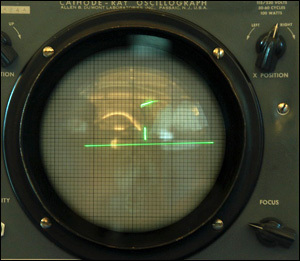 Game: a two-dimensional, side view of a tennis court on the oscilloscope screen, which used a cathode-ray tube similar to a black and white television tube. The ball, a brightly lit, moving dot, left trails as it bounced to alternating sides of the net. Players served and volleyed using controllers with buttons and rotating dials to control the angle of an invisible tennis racquet’s swing.